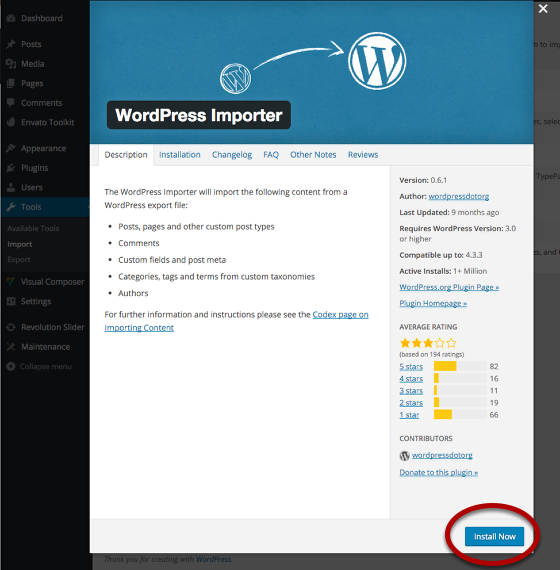 Learn how to import demo content into your WordPress site via Theme Options or Manual Import. Locate the demo you wish to install and click the Install button. Alternatively, you can preview the demo using the Preview button. Upon clicking Install, read the notice carefully before proceeding, activate the required plugins via the WordPress Admin > Appearance > Install Plugins, click OK to continue. The alternative method to importing demo content is to do it manually. Follow the steps below to achieve this. You maybe required to install the WordPress Importer plugin. If not, move onto STEP 3. Follow these steps to download the Theme from your ThemeForest downloads section ( If you haven’t already ). Select which demo you want to import e.g. demo_1 for Demo 1 ( check the preview.png image for each demo to see which number correlates to which demo ). Select which demo you want to import e.g. demo_1 – check the preview.png image for each demo to see which number correlates to which demo. Open the file within a text editor, copy the contents of the entire file. Click Revolution Slider ( If Revolution Slider isn’t installed, goto Appearance > Install Plugins and click Install on Revolution Slider ). If the demo you’ve selected contains a revslider_X.zip file, click Open.